in Eden’s long-term tribal history. our Faith had undergone tremendous strain. no race except our own believed in God. as far as evidence and logic went. of ninety ways it might be better wrought. Without the sun, nocturnal winds were chill. rebounded from the glowing, smoking sand. confronted night’s remorseless cold again. to plan the cycles of the nights and days. our hides one week of every month, at most. the sun would not have time to wax so strong. we’d always be enjoying dusk or dawn. we wouldn’t alternately scorch and freeze. created it in endless quantity? and bruised our feet, and overwhelmed our souls. expressly to confuse the mortal mind. and yet we scribes can find them where we please. the triumphs and misfortunes of the Tribe. they’re found by handsful in the arid ghylls. But how could shells have come from sea to land? Such oddities were hard to understand. producing shells, He should have made them seas. but this was speculation, nothing more. with much success–since God remained unfound. to be–or were we just incompetent? His privacy, as some of us inferred? true after all, that we were doomed to fail? of philosophic issues deep and moot. to ransack their oasis for the Word. That race of men had mimed some kind of bird. distinctive: towers of enormous height. and entered through the windows, not the doors. were those too young, or old, or sick, to fly. created by a special act of God. as nearly all their kind had done before. were two-by-fours, on which they perched and laughed -. bespattered with the mess the birds had dropped. fresh droppings, mostly underneath each joist. we apes have naturally known how to climb. by desperate defenders as they fled. they dived through windows, taking to the air. while we pursued, as far as they could fly. the braves of Eden slew them on the ground. built for their convenience, not for ours. –for comfort–quite a bit superior. provided punctuation for his speech. One ape, there was, inclined to disagree. “Was genocide essential?” argued he. by making sure that not a soul remained? toward realizing nobler tribal dreams? of our convictions to the world’s uncouth. when we had hanged its founder to a tree. The Briny Desert was so aptly named! oases. Elsewhere nothing ever grew. without the least diminishing our thirst. The Tribe marched on. No stop was very long. because the Chief himself became confused. decide which views were wrong and which were right. and that, the Chief predicted, might be bad. He wasn’t quite the dumbest Chief we’ve had. were spent in arguments, which led to fights. from cosmic flaws that were so plain to view. there be a God omnipotent and good? too gross to be ascribed to Deity. was good in ways too deep to understand. 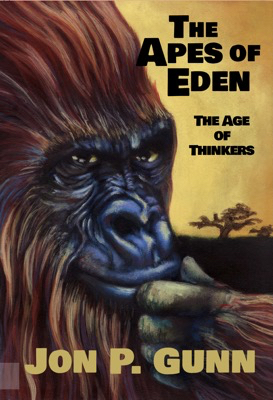 no ape could know what He considered right. for Purposes no mortal understands. and, by sheer numbers, strip it down to sand. but which, we could be sure, were Right and Good. but failed to prove He was a Friend of ours. to build their dwellings, as we’d seen them do. but, generally applied, was quick to fail. was this “remodeled” land devoid of men? but could–or would–they turn the lakes to salt? that God Himself had made was Eden’s land. despoiled by apes and beasts from all around. the world. To him, not God, the fault was laid. but made Him seem not-quite-omnipotent. we’d hoped to find the Deity somewhere. We would, of course, have stayed, had God been there. where mere subsistence was a chore to find. So tribal orthodoxy fell apart. To build a new one, where was one to start? that might have challenged Eden’s tribal laws. as starting points from which to deviate. we weren’t quite sure what orthodoxy was. debated openly, we weren’t so sure. Our theories needed data not supplied. If we could find some facts, we could decide. Our need for solid facts was growing strong. beset with Crises of Identity. the land we now approached was really rough. We’d find no more oases; that we knew. all right for frying eggs, no place to tread. with toasted feet, came hopping back again. this natural barrier had stopped us dead. one either has to stop, or go around. determined which direction we’d proceed. across the sands, at least we got somewhere. at least there’d be a town to sack and burn. we chose a trail that led us almost west. may find himself forsaken and alone. and nearly died of hunger, heat and thirst. us into dull and dreary spots to look. we never should have wandered, as we trekked? them as the quickest way to end the Quest. The situation, now, was not the same. The only trail led back the way we came. a prospect leaving even us aghast. and turning back, was more than we could take. we dared not forge ahead, nor yet recede. some means by which the problem could be solved. This was by far the longest of our stops. We even tried our hand at planting crops. Our Quest, it seemed, might be deferred a while. who said, “We shouldn’t let this get us down. we left our tribal home, to end up here. that tells us how to go about it next. to quiet scholarship than holy war. when we were led from Eden by our Sage. or else from sources known to them alone. made grist for dialectic eloquence. were re-examined, word by line by page. that helped us solve the Cosmic Mystery. was often based on insubstantial ground. stuffed back in sacks and ported all around. or heavy-duty blackjacks in a brawl. The wonder is that they survived at all. were later on recalled, in garbled form. to songs and sagas that they hardly matched. with one part truth to ten parts balderdash. our efforts weren’t without accomplishments. misplaced by scribes and chroniclers of yore. these reconstructed records for the Truth. and what the baffling contradictions meant. we left each other in a gnostic daze. gave rise to multiplicity of sects. which experts coined, expressly for this use. free of errors, bias or delusions. what manuals of madness we’d devised. such questions as: On what is Knowledge based? Can such a thing as Certitude exist? In what does valid Evidence consist? of Logic don’t embody subtle flaws? if Logic’s rules are slyly incorrect? to show that scholarship was justified. condition, they were still the best we had. through modes of thinking more or less impure. research began to lose its novelty. depend upon a documented source. that scribal lucubrations were absurd. to which they still pretended to adhere. Head Two could guide the stars’ nocturnal flight. Another school could prove the heads were three. Thus rose the Doctrine of the Trinity. his office being one of liaison.